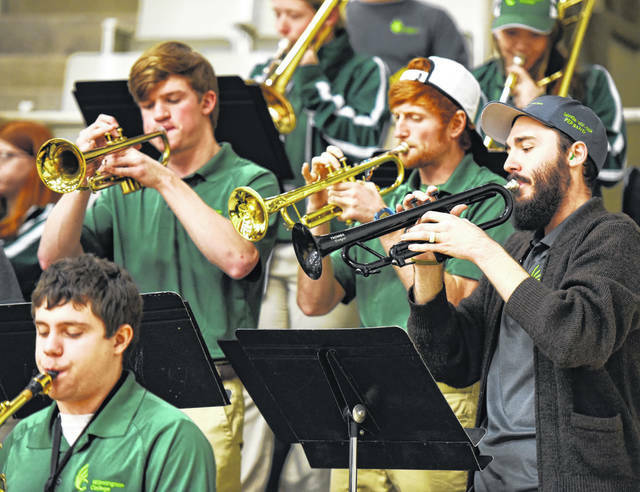 During a recent home basketball game, Wilmington College Band Director Stephen Wadsack, right, plays trumpet alongside Joseph Schmidt, left, and Cameron Phelps. Jordan Moore is playing alto saxophone. Wilmington College is building upon the success of its Quaker Thunder Pep Band with plans to stage the institution’s first-ever marching band in the near future. While admitting it’s an ambitious aspiration, college officials look to the success of the ever-growing pep band since a handful of enthusiastic musicians first played “Hang On Sloopy” at a home basketball game last winter. Its membership is already 16 with a goal of 25 this coming fall — and therein lies the foundation for a marching band, according to Stephen Wadsack, the newly hired director of athletic bands and instrumental music instructor, who has seen numbers triple since he first directed the band at several home football games this fall. “Students are craving to express themselves creatively,” Wadsack said, noting that most new freshmen, in navigating their new world in college, seek a sense of community and emotional connection with others through shared interests and experiences. The college believes that such exceptional individuals should be rewarded for the talents they share through their commitment to the band. WC is offering annual $1,000 Talent Awards to new members of the pep band beginning with the fall 2019 semester. Founding members of the band are already enjoying the windfall. Dennis Kelly, senior vice president/chief enrollment officer, said the scholarship is the latest merit-based award offered by the college, which provides Talent Awards to select equestrians and theatre students. WC also is providing financial awards to incoming students, involved with national scouting organizations, who have attained Eagle Scout or Gold Award status. Kelly added that the college’s ambitious plans for instrumental music have interested alumni and friends wishing to provide financial support. WC’s successful #GivingTuesday promotion in November resulted in much-appreciated seed money for the program. Wadsack said the college’s new endeavor in instrumental music parallels its longtime offerings in intercollegiate athletics. Both sports teams and musical groups provide opportunities for leadership development, personal growth and hands-on learning experiences. Wadsack said he wants to emphasize to high school band members that regardless of their academic major, they will have time to pursue band membership at Wilmington College. “Also, you will have great experiences at WC that will stay with you for the rest of your lives,” Wadsack said. Randall Sarvis is the director of public relations at Wilmington College.